Read all the instructions before you begin. Place plastic on floor, this might be a little messy. Make sure your victim is healthy, comfortable and wearing old clothing. If you've never used alginate before, we suggest you try a small amount before you throw yourself into this project. That way you'll get the feel for it and know what to expect. If you wanted to make an arm or leg I would suggest using twice as much alginate depending on how high up you go you might need 3 times as much. We're going to make a cardboard frame that you can fit your arm into. 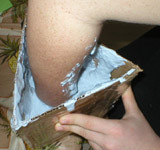 It shouldn't be too wide, as you'll be filling it with alginate and it would be more cost effective if you made the frame so you have about ½" on all sides of the arm & hand and about an inch at the bottom. Make sure the bottom is sealed up well. Get the clay ready for the mold you are about to make. 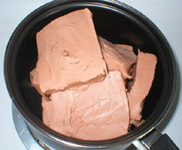 Cut the clay in slices and place it over a low heat, mixing occasionally until it's creamy and fluid. You can heat it in a microwave but it doesn't come out as nice as when it's heated over a stove. Be careful! It will burn the skin off of your body if you aren't. Let it sit on a very low stove while you make your temporary cast. For this hand we used almost 2 lbs. of alginate. 9 - 10oz cups of alginate and 9 - 10oz of warm water. 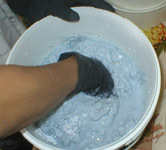 Wearing your gloves measure out the alginate into a bowl. Measure and add the water, mixing all the time. You have 8 minutes of working time until the alginate sets up. Make sure it's completely mixed and creamy. Have the victim put their hand inside the box so it's about ½ to 1" from the bottom. Pour in the alginate. As you're pouring it in be aware that air bubbles might get trapped around the hand or at the bottom of the box. Have the person move their hand a bit and shake or hit the bottom of the box to get as many air bubbles out as you can before it sets up. You will always get some, but the less the better. 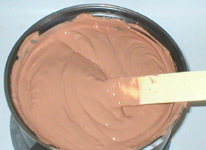 Test the alginate in the mixing bowl for set up. You'll know as it will become a solid. Have your victim wiggle their fingers slowly. They'll feel their hand become loose. This also works with arms and feet. Legs work a little different. If you find it hard to pull out when doing a larger body piece the box and some of the alginate might need to be sliced to free it. Hands will pop right out. Don't make fists, you'll have to cut the alginate as well and then clamp it together in some fashion when you pour in the clay. Hand is out and it's looking good. Slowly and being mindful about not trapping air bubbles, pour in the melted clay. 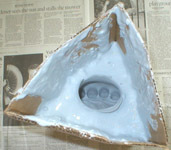 Again, shake the alginate mold and hit the bottom of it to loosen any trapped air. Fill up to the top. I usually let it sit overnight to make sure the middle of the piece is cooled and hardened. Or you can put it in the refrigerated to help speed up that process. Don't be deceived by a cool hardened outside, the middle might still be liquid. 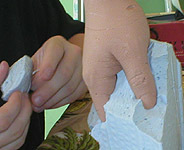 You don't want to pull the piece too soon and distort the hand. When the clay is totally hardened carefully, taking your time, pull apart the cardboard and pull away the alginate. You have a clay piece under there, so be gentle. You don't want to get this far and ruin the piece by not taking your time cleaning it off. Here's the clay hand. It has a few flaws, but no problem. I put it in the refrigerator to harden up a bit more before I'll clean it up with some sculpting tools. Filling in small holes left by air pockets and any other flaws I find. I use Modeling clay because it has no sulfur. But it tends to be a bit soft. That's why I put it in the refrigerator before I clean it up. You can use Roma Plastilene in a #3 hardness or mix the two. But you'll also have a nasty sulfur smell when you're working with it. 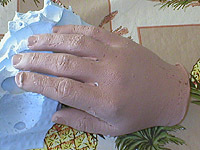 Next step will be making a mold off of the hand with plaster.